Every year around Spring Festival, there’s a flood of Chinese expats from the Great Chicken over to the Land of Smiles. I don’t have an exact number, but judging from the way my Facebook and Instagram feeds are currently bursting with everyone’s Thailand pictures, and from the number of people I’ve already run into in person in Thailand, it’s approximately a LOT of laowai. And when laowai come to Thailand, there are certain things we go crazy about. Here are 14 of them. I can take a picture of me on an elephant and post it on social media right then and there (except that it would be wiser to wait until I wasn’t on an elephant). I can Google the nearby restaurants while I’m on the way to dinner. I can Skype my family while I’m out and about. I can do it all WITHOUT needing to turn on a VPN and without having to reload things a million times. News sites, social media, email on the go – they all just work! Freedom!! So much ice. In all the drinks without asking. Giant coolers full of it at street stalls to add to beverages. They even sell bags of the stuff at 7-11. It makes me want to walk in and buy a bag of ice, just for the sheer pleasure of being able to do so. I was not a donut fan until I moved to China, the donut desert. Sure, there are “donuts” in China, but they are basically a circle of bread with a wax coating. And sprinkles. Thailand has proper donuts. And they are everywhere. Mister Donut and Dunkin’ Donuts are in every shopping center, and we spotted Thai tourists hauling boxes of Krispy Kreme donuts onto flights from Don Mueang airport. No fritters yet, but I’m happy with Bavarian cream filled and chocolate old-fashioned. Yum. Ice cream in China comes in two varieties: soft serve or freezer burned. Meanwhile, on this side of the Mekong, you can get fantastic ice cream from international chains and local shops. Yikes, good donuts AND good ice cream? Good thing we also do a lot of walking while we’re in Thailand. Even in many larger Chinese cities, laowai get lots of stares and sly attempts at getting their picture taken. In Thailand, it’s rude to stare, and there are just soooooo many foreigners of every size, shape, and color that we don’t attract any attention. Ahhhh…feels good to be one of the crowd. I avoid Western toilets in China if they’re in a public restroom because they are inevitably abused and filthy. Here? Sparkling clean, even in places that aren’t upmarket or targeted towards foreigners. My family is spoiled that we’ve always lived in places in China with great air quality. But laowai from places like Beijing and Chengdu use their time in Thailand to remind themselves of what a blue sky looks like, and try to breathe as much clean air into their lungs as they can. It is a treat to be able to assume that you can walk into any hotel, restaurant, or shop, and there will likely be signs in English and/or workers who can at least manage a brief interaction in English. (I still advocate learning some Thai, friends!) Maybe it’s only native English speakers who enjoy this one, but it’s a nice treat to give the Mandarin portion of my brain a little holiday. Of course, if that is too weird for you, you can always stick with Mandarin. Within the past few years, as the number of Chinese tourists skyrockets in Thailand, Chinese signs have been popping up all over tourist locations, and Thai merchants have rapidly been learning basic Mandarin to cater to Chinese tourists. In fact, I was in an off-the-beaten-path 7-11 and heard the cashier functioning totally in Mandarin with a customer who was trying to get a SIM card. Holy trade language shift, Batman. When the A/C is on in China, it’s usually set at the warmest temperature and not doing very much to actually cool the area. In Thailand, they take their air-con seriously. You are going to be greeted by a beautiful blast of ice-cold air when you enter malls, hospitals, and hotel lobbies. In fact, if you are in a large conference room for hours at a time (ahem), you might want to take a scarf or jacket with you. 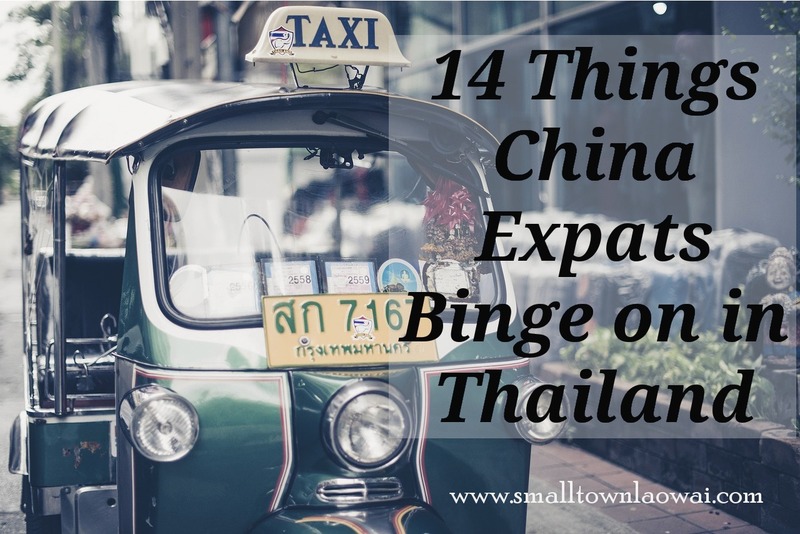 Most China expats I know celebrate a trip to Thailand with a joyous burst of dental cleanings, health checks, elective procedures, and immunizations. (“A round of shots for everyone!” Ha ha.) Oh, and they even give birth to babies! High quality of healthcare + reasonable rates = happy, healthy China expats. Sorry, Mother Earth, but it is pretty nice to go back to automatically being given a free plastic bag at every store. The king of convenience stores is everywhere in Thailand and is stocked with all manner of things one cannot find in China. A&W root beer? Honey roasted sunflower seeds, already shelled? Kit Kats and Mars bars? Thai iced tea on tap?!? It’s a haven for all tourists with its cornucopia of snacks, drinks, and necessities, but it feels even more amazing for those who have been living behind the Panda Curtain. When you sit down at a restaurant, they’ll bring you (cold!) water without you even asking for it. If they don’t, there is usually a tray with a pitcher of (cold!) water and glasses for customers to use to help themselves. It feels so luxurious. Of course we binge on Thai food! We’d be crazy not to. It’s cheap and foodie-grade delicious. I usually try to get at least one round of khao soi, mango sticky rice, tom ka gai, massaman curry, green curry, papaya salad, and banana chocolate roti. And that’s just the top of the list. What’s on your must-eat list for Thailand? I think you would have a great time in Thailand! I have a ticket for Feb 28th, and I’m counting the days! Don’t forget the freedom and joy that comes with wearing Thai pants for the extent of your vacation! Good addition, Cari! I hope you have a great time on your trip next month. Very interesting post! My family just came back from Kauai, Hawaii, do you know the plastic bags are banned over there? You either bring your own bags, or purchase those reusable shopping bags. So we purchased two bags the first time in Wal-Mart, then we kept forgetting to bring the bags we purchased last time, so we ended up with a bunch of blue Wal-Mart shopping bags. No, I didn’t know plastic bags were banned in Hawaii. Maybe they are following China’s lead. 😉 I guess now you have some souvenirs from your trip! Thailand is Indonesia’s Malaysia. What Malaysia has that Indonesia can’t offer me: Lice Shampoo, Shaving Cream and Cheese the kilo. Ahhh…take me away. We were in Thailand over Christmas and our guide at the Elephant sanctuary was speaking very good Mandarin with the mainland Chinese tourists in our group, he told me he picked it up when he was leading trekking tours. It’s amazing how many people in Thailand seem to have picked up Mandarin simply through interactions with tourists. I’m impressed! As someone who’s spent every 寒假 in Thailand for the last several years, amen to ALL of that!!! I will also add that we binge on (ironically) non-Thai food. We LOVE the Tex-Mex and BBQ joints opened by ex-pats in Chiang Mai and Bangkok because we don’t get those foods our hearts miss in our China-city! But man do I feel sheepish when my friends in America ask me, “I’m vacationing in Chiang Mai soon! You’ve gone a bunch of times– what do you recommend?” And so many of my favorites are non-Thai! I’m THAT American tourist! Gah!